Scientific and technical cooperation with international organizations and national metrology institutes of foreign countries is an integral part of the activity of the NSC “Institute of Metrology”. This aspect of the activity strengthens the scientific potential and competence of the institute’s experts. General Conference on Weights and Measures (CGPM). 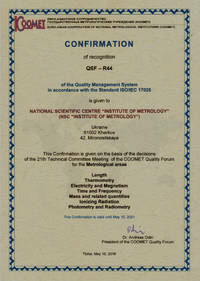 In 2016 the quality management system of the NSC “Institute of Metrology” was recognized by the COOMET Quality Forum as meeting the requirements of ISO/IEC 17025; as a result of an international accreditation a Conformity Certificate was issued. In 2007 the NSC “Institute of Metrology” was authorized by the International Bureau of Weights and Measures (BIPM) to place the CIPM MRA logo on its calibration certificates. 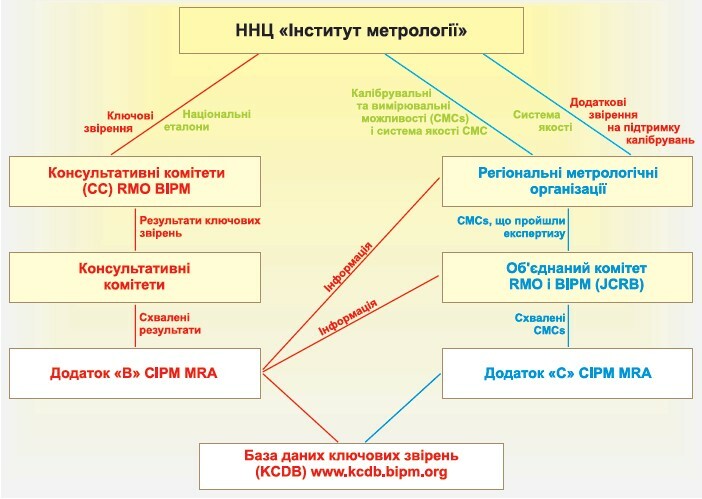 The implementation of the CIPM MRA includes the carrying-out of international comparisons, demonstration of the competence and recognition of the quality management system of the institute, publication of the Calibration and Measurement Capabilities (СМС) of the NSC “Institute of Metrology” in the BIPM data base. The NSC “Institute of Metrology” cooperates with VNIIMS (Russia), BelGIM (Belarus), ?OA (Germany), SMU (Slovakia), KazInMetr (Kazakhstan), and NMC (Azerbaijan) on a bilateral basis.